Salt is all the rage these days- from salted chocolate to special salt scrubs to even flavored salt it seems no matter where in the world we go, we see some sort of salted souvenir. Honestly, until we started traveling I didn’t even realize there were different types of salt, nor the benefits of salt. If you’re at all interested in salt or saline there is only one place in the world you can go to truly experience salt- the Dead Sea. Bordering Israel and Jordan, the Dead Sea has the highest content of saline in the world. Believe it or not, even the worst swimmer can float in the Dead Sea. If you go in, the rules are simple, absolutely, positively no splashing. The salt content is so high that the buoyancy will actually sweep you off your feet! Besides being a fun way to experience total weightlessness, the Dead Sea is also home to some of the most mineral rich mud and thus skin care treatments in the world. It turns out that the same natural forces that increased the salinity of the water also increased the percentage of minerals that make your skin and body feel and look gorgeous. You may have heard of mud treatments, but no mud treatments compare to Dead Sea mud treatments. In fact, some people make a pilgrimage to the luxury spas and hotels like the Kempinski Hotel Ishtar, that line the Dead Sea, not for only a vacation, but also for body enriching mud and skincare treatments. All over the world products from the Dead Sea are recognized for their legendary properties. 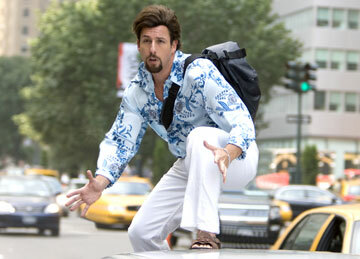 Some sell for hundreds of dollars an ounce, well out of the price range of this traveler! Mud, luxury and salt, who knew that combination could be so beautiful? IF YOU GO: The Dead Sea can be accessed from either Jordan or Israel. Many people make a vacation loop from Petra to the Dead Sea on the Jordanian side, taking in spa treatments like mineral mud facials, massages and salt scrubs to rejuvenate at some of the world’s most exclusive and luxurious resorts before returning home. Don’t skimp on the experience, Dead Sea treatments really do wonders for your skin-I even took a few bottles of product home with me! Homus, hummus, humus, humos, hamos, houmous, seriously Wikipedia has eight spellings for it, but in truth it’s all the same. Pureed chickpeas, tahini, olive oil, lemon juice, and some spices, humus is found on almost every middle eastern menu. Not quite as popular as in “Revenge of the Zohan,” humus can be categorized as almost an obsession for some people. Everyone’s mom seems to make the best humus, leading me to wonder how humus reached such cult status. I wandered around the grocery store looking for a small tub of humus for a picnic, the only size to be found was nearly ½ a kilogram! Humus in the middle east is slightly different than what we have on our shelves in the United States. More like a think liquid than a paste, humus is often used as a condiment on falafel or shwarma , not as a dip. Chickpeas have been part of the Mediterranean diet since before 2500BC and its possible that the Ancient Egyptians even ate humus or something like it. The first documented account of humus dates to a 13th century Arab cookbook, but unsurprisingly few cookbooks were published in the medieval period, so really we’ll never know. Actually the origins of Humus are rather controversial. In 2008 a Lebanese food association lobbied their government to request protected status from the European Commission as a uniquely Lebanese food because it has become so popular in Israel. It’s so popular in fact that there’s an Israeli food website dedicated to humus: http://humus101.com/EN, which covers the controversy much better than I can. So maybe the dip isn’t as boring as just pureed chickpeas. Although we had been tipped off not to arrive until the afternoon when the tour groups depart, we were shocked at the sheer number of visitors. With no exaggeration there were thousands of people exploring Petra when we arrived mid-day, and the noise bouncing off the canyon walls in front of the treasury sounded more like a stock market trading floor than an ancient archaeological site. After being abandoned by the free tour guide, who began by telling us the tour was not obligatory and we could leave at anytime, we headed off straight to the Monastery, a 40 minute hike at the far end of the site. By no means a secret place, the Monastery was virtually deserted late in the afternoon and for long stretches of time we had the place nearly to ourselves. It was magnificent and the views from the surrounding cliffs were breathtaking. 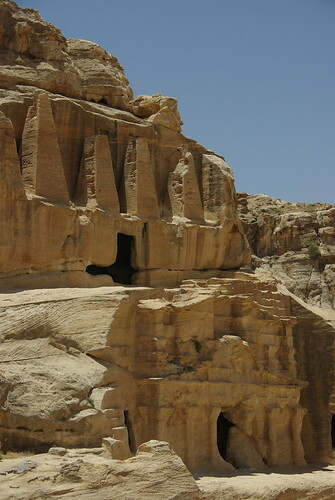 Although nothing remains inside the tombs today, local Bedouins lived in many of the caves until the 1980s. Thrown out of the site by the government and moved into modern apartment complexes outside the site, tension remains between the Bedouins and the Jordanian government. To appease the Bedouins, the government has looked the other way at the numerous souvenir shops, food stalls and wandering vendors scattered throughout Petra. Without a doubt the market like atmosphere near the amphitheater takes away from the grandeur of the place. Unfortunately we saw children selling jewelry and goods throughout the site in numbers that we haven’t seen since Central America. 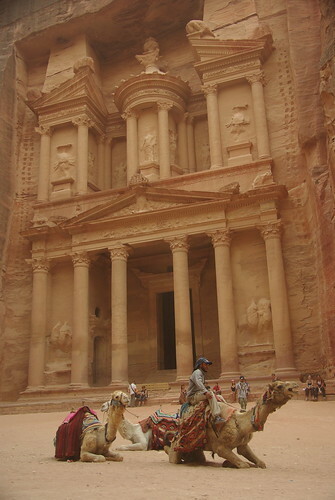 The most photographed site in Petra is the Treasury, which is actually a tomb that never contained any treasure. An urn carved into the upper facade was once believed to contain the treasures of an Egyptian Pharaoh, which needless to say caused any number of objects to be thrown at the facade in an effort to break the urn and spill its treasures. The only treasure ever found in the Treasury though, would of course be the Holy Grail rescued by Indiana Jones. The entrance into the Treasury was blocked off so unfortunately we didn’t get a chance to follow in Harrison Ford’s famous footsteps. IF YOU GO: We purchased the 2 day pass allowing us to sleep-in and visit Petra refreshed and at our leisure rather than at 6am. The tour groups arrive at 8 and start to leave around 3pm, by 5pm we were virtually alone and by 7 pm had the Treasury all to ourselves. 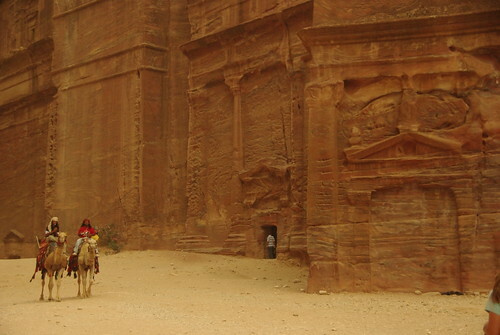 Petra technically doesn’t “close” but the guards will ask you to leave if they see you after sunset, especially if there is a ‘Petra by Night’ show that evening. Staying through sunset we saw the set-up of ‘Petra by night’ and walked out of the Siq by candle light. If you plan to hike to the Monastery, which we’d recommend, go in the afternoon when there is more shade and fewer people. Bring plenty of water- we were able to fill up our bottles in the restaurant. FYI, entry prices are scheduled to increase dramatically in November 2010. See more Petra photos here. Ever since arriving in Ethiopia we’ve been excited to get out of Africa, not that its been bad at all mind you, its just that Africa is difficult. Emotionally, physically and mentally Africa can take it all out of you without you even realizing it. It’s been a pleasure sharing the adventure with others along with way, but frankly we were just exhausted of being in the developing world. I know how that sounds and I realize how lucky we are to be able to leave those difficult situations, but it’s the truth, it was hard. We needed a long break, badly. Needless to say it wasn’t with heavy hearts that we took the ferry to Jordan. In fact it was with shear excitement for the rest of the journey and perhaps even some anxiety at moving on to another continent that we boarded the much delayed boat. As they ferry motored away from Nuweiba and the Sinai Peninsula at sunset we sat comfortably in the air conditioned lounge playing cards and swapping stories neither of us looking back for one last glimpse. A week and a half after leaving Africa for good I’m recovered and those dangerous rose colored glasses seem to be on my eyes. Of course we had an amazing time in Africa and I don’t regret going for one minute. More than South America though Africa tested us. It was physically challenging (Mt. Kilimanjaro), emotionally challenging (Ethiopia) and sometimes just downright frustrating (everywhere else), but it was an experience I’d never trade and will never regret. 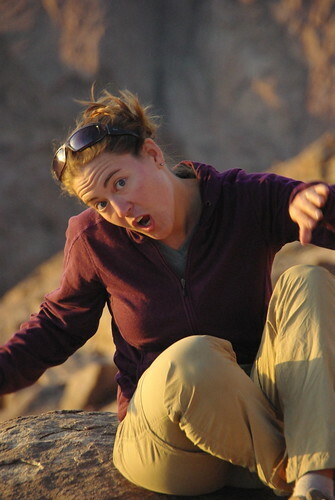 IF YOU GO: We took the “fast” ferry from Nuweiba to Aqaba. From what we gather delays like this are pretty normal, however there were tons of taxi’s willing to negotiate decent group rates to Wadi Musa (Petra) from the port, even at 11pm! Sold as a street side snack falafel is as common as coca cola in the middle east. 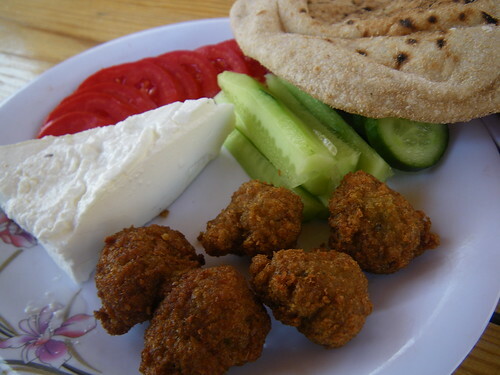 Deep fried balls usually made from chickpeas, falafel can be served alone, with fuul or stuffed into a pita with fresh vegetables and salads. In Sudan the falafel or t’amiyya was made of fava beans and was served alone or as an addition to fuul. It was mostly plain in flavor and texture. In Egypt we started to see falafel in pita with some salad and sometimes a tahini based sauce. In Jordan we started seeing falafel topping bars, but it wasn’t until Israel that we had the full on falafel sandwich with chips, sauces, pickles and salads. So its deep friend, but actually falafel is packed with lots of vitamins, fiber and iron making it also relatively good for you! Put the dried chickpeas in a large bowl and add cool water to cover by 2 inches. Soak the beans in the refrigerator for at least 18 hours or up to 24; the chickpeas will swell to triple their original size. Drain and rinse thoroughly. Put the soaked chickpeas in a food processor and pulse to coarsely grind, not until smooth but with no whole chickpeas remaining either. Add the baking powder, onion, garlic, spices, and herbs; process until the mixture is pureed; scraping down the sides of the bowl as needed. Taste and season with salt and pepper. Transfer to a bowl and refrigerate while heating the oil, this should take about 15 minutes. Pour 3-inches of the oil in a deep fryer or deep heavy pot and heat to 375 degrees F.
Roll the falafel mixture into ping-pong size balls. (Alternatively, use an ice cream scoop.) Carefully slip a few at a time into the hot oil, making sure they don’t stick to the bottom. Fry until the chickpea fritters are a crusty dark brown on all sides, turning as needed, about 5 minutes per batch. Remove the falafels with a slotted spoon and drain on a platter lined with paper towels. Open the pita bread halves to make pockets (don’t split all the way) and put 4 fried falafels into each. Drizzle with the tahini sauce and layer with lettuce, tomatoes, and cucumbers. Serve immediately.